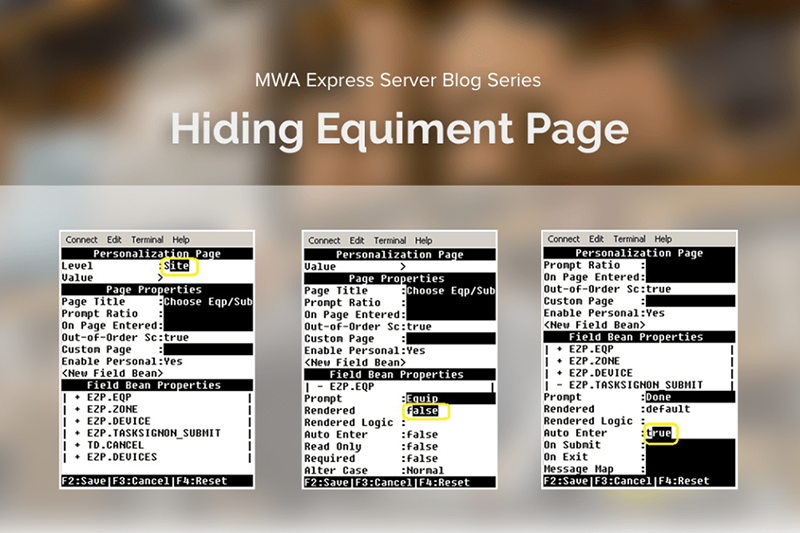 In this series of MWA Express Server blog, we will look at how we can increase warehouse user efficiency by hiding the WMS Equipment/Subinventory selection page using MWA Express Server. WMS Equipment/Subinventory selection page is a mobile page for letting user select the equipment and subinventory before entering task related mobile pages. The selected equipment and subinventory are saved in session and will be used by WMS task dispatch engine to filter tasks. This feature is desirable for some companies, but other companies may not use this feature at all and would like to skip this page to reduce keystrokes and streamline operation. MWA Express Server is a tool that allows personalization of all mobile pages. It has many features, part of them are the ability to hide fields and automate enter key on fields. We will use these two features to skip the Equipment/Subinventory selection page. During personalization of the mobile page, we are going to hide the first three fields (Equipment, From Sub, and Device) and automate enter key on Done button. Here are some screenshots of the personalization process. The first screenshot shows the personalization is done at Site level. The second screenshot shows that we are hiding the Equipment field. The same personalization will be done for Subinventory and Device field. This screenshot shows how we can automate an enter key on the Done button. By doing this personalization, this essentially skips the page so user will go to the next screen without doing anything. This personalization can be done at site level, responsibility level, organization level or user level. The multi-level personalization flexibility allows some companies who may want to skip the page globally or others who want to skip the page for certain responsibility, or organization or user, while keeping it active for the rest.